Each year, monarch butterflies flutter through the summer breeze while you’re out walking your dog on a sunny afternoon. You find them when you’re fishing along the grassy river bank, or when you’re out removing weeds from your garden. Have you ever stopped to think about how they got there? It’s actually quite the story. Each year, four generations of monarch butterflies are brought to life, and each generation undergoes four life stages: egg, larva, pupa and adult butterfly. This annual cycle begins in the northern and eastern parts of the United States in March and April, when monarch eggs are laid on milkweed plants. After about four days, the eggs hatch and tiny little monarch caterpillars emerge. They immediately set out to gobble up as much milkweed as they can. Two weeks later, the caterpillars are fully grown and ready to transform into butterflies. To do this, they find safe places to form chrysalises around themselves, which begins the 10-day process called metamorphosis. Once they complete the process, the elegant, winged creatures we’re all so familiar with appear: the monarch butterflies. Monarch butterflies only last in this form for about two to six weeks before dying. But, prior to passing, they reproduce and lay their eggs on milkweed plants for the next generation. The second and third generations follow the exact same format as the first. Generation two spans from May through June, and generation three spans from July through August. The fourth generation does things a bit differently, though. Instead of dying after a two to six week period, they migrate to the warm climates of California and Mexico to live for another six to eight months before coming back to the northern and eastern regions of the U.S. to start the whole process over again. These bugs are truly amazing, and you probably thought that even before you knew about their life stages and generations. Unfortunately, you may not be seeing these beautiful bugs as much lately. According to the National Wildlife Federation, the monarch butterfly population has dropped by 90% in the last 20 years — a decline equivalent to reducing the human population of the United States down to just under the size of California’s. The main cause of this rapid decline has been traced back to herbicide usage. While herbicides — such as Roundup and other chemically concocted weed killers — may do wonders for your yard and garden, they are devastating to the monarch caterpillar’s one and only food source: milkweed. 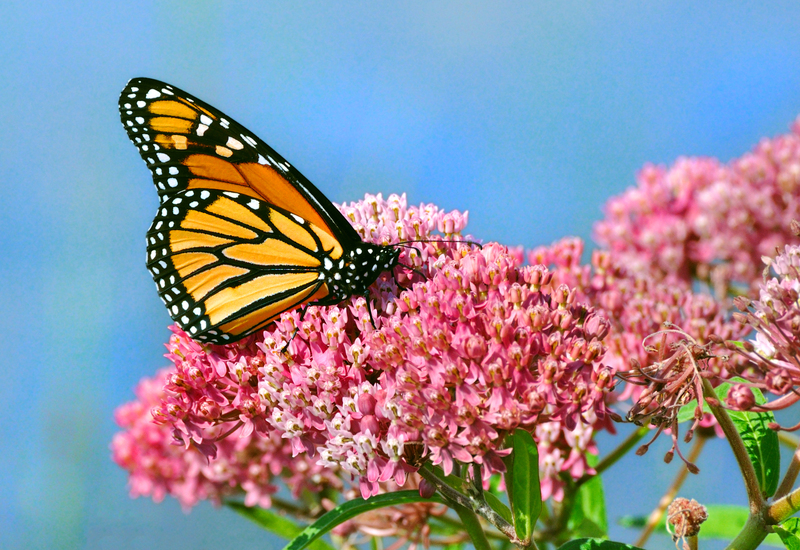 Since herbicides kill milkweed, and monarchs rely on milkweed throughout their entire life cycle, an increase in herbicide usage is linked to the decline of both milkweed and monarchs. Luckily, we can help save the monarchs by ending personal herbicide usage and bringing our inner botanist skills to the backyard. What are you waiting for? Oh, that’s right. You probably want to know how to grow the stuff.